Sources: Sources for data in tables: Equity Market and Fixed Income returns are from JP Morgan as of 04/05/19. 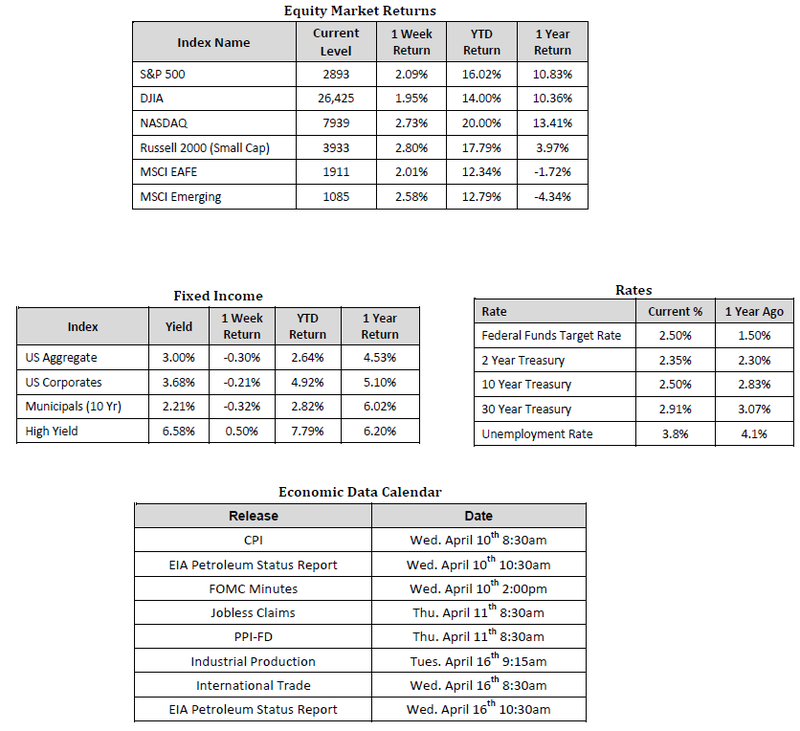 Rates and Economic Calendar Data from Bloomberg as of 04/08/19. International developed markets measured by the MSCI EAFE Index, emerging markets measured by the MSCI EM Index. Sector performance is measured using GICS methodology. Global equity markets came out of the gates strong to start the second quarter of the year. In the U.S., the S&P 500 Index advanced 2.09% to a level of 2,893 last week. The index is creeping closer towards its record high closing price of roughly 2,930, which was set in September 2018. Moving down the market capitalization spectrum, the Russell 2000 Index, a measure of the nation’s smallest public companies, outpaced its larger counterparts with a gain of 2.80% for the week. Overseas, the story remained the same as developed and emerging markets returned 2.02% and 2.58% respectively as measured by the MSCI EAFE and Emerging Market Indexes. In fixed income, the U.S Treasuries yield curve steepened last week alleviating some investor’s concerns about a looming recession, which we still are not particularly concerned about in the near term. The 10 year U.S. Treasury closed the week with a yield of 2.50%. Positive signals across the board fueled equity markets and gave investors a sense that this record bull market run may not be finished just yet and can be supported by relatively solid economic fundamentals. Early in the week the world’s two largest economies; the U.S. and China, eased some concerns regarding a slowdown in global economic growth with some encouraging data releases. In particular, Chinese manufacturing activity expanded in March and the U.S. manufacturing PMI rebounded from the two year low that it experienced in February. We received more positive news during the middle of the week from these two countries, this time related to trade negotiation developments. This sent trade sensitive sectors, such as industrials and materials, higher on the news. Finally to cap off the week, the Labor Department released its first Friday jobs report. The report showed that payrolls significantly beat expectations, hourly earnings rose 3.2% year over year, and the unemployment rate remains stable and low by historical standards. With all of this encouraging information highlighted from last week, and corresponding stock market advances, we caution investors not to get complacent as the days of heightened periods of volatility are not behind us. It is still important to work with an experienced financial professional to help manage portfolios based on the unique objectives and risk tolerances of each individual investor. We remain optimistic for equity returns throughout 2019 on the back of low interest rates, a confident consumer, strong economic fundamentals, and company earnings growth. However, at this stage of the cycle we can expect market participants to become increasingly sensitive to any negative news reports.